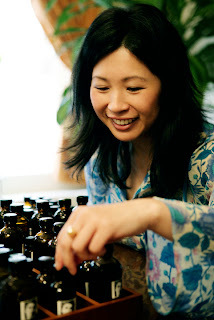 In a phone interview, Mandy Aftel told us that she gives preference to lighter fragrances in summer and generally believes that a scent should be appropriate for a season and a time of day rather than for specific social occasions. It is a lot like eating, says Aftel, stressing the importance of seasonality; some things are more appealing in summer, some in winter. Speaking of specific essences, to the sourcing of which she devotes a lot of time, care and effort, Aftel mentioned that she considers the ones that went into the making of her new perfume, Cognac, to be well-suited for summer. These essences are ginger, blood orange, and olive. Aftel also likes sarsaparilla, which has a light, fruity, root-beery fragrance, as well as boronia, the smell of which she describes as a cross between freesia and raspberry. Lightness for Aftel seems to be the most important characteristic, however she stresses that when she speaks of lightness, she means it in terms of odor profile. Lightness for her does not equal simplicity, the scent should be light but complex. Mandy Aftel’s favorite holiday destination is Oaxaca, Mexico, which she finds to have a stimulating, artisanal environment, and to be beautiful, lush and aromatic. “In the summer, I prefer to fragrances that are sheer and simple. Mostly single notes like neroli. I also like simple floral green fragrances for summer too. Freesia, iris, linden blossom. These are terrific in the summer. The other day, I made a simple spritz of geranium and spearmint. So deliciously cooling. I think the smell of berries is scrumptious and other fruity fragrances. I love my U4EAHH! because it's so juicy! Pear, pomegranate, cuke, aloe & waterlily. Unfortunately, it isn't the best for my skin type. Go figure. But I love it on other people. It's a very easy to wear fragrance for the hot season. 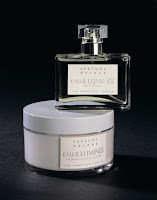 I also love Guerlain's Pamlelune. L'Artisan's Mimosa is refreshing for this season too. And I have Santa Maria Novella's Ginestra. It's delicate and barely there. I also have a beautiful violet fragrance that I got from a tiny specialty Italian boutique here in San Francisco called Bell'occhio. They're the only ones in the world who sell it. Images courtesy of Mandy Aftel, Sarah Horowitz-Thran, Jalaine Sommers, Yosh Han and DelRae Roth. The scent of boronia is so heavenly that it cannot be described with mere human words. We bought four plants of it this spring. When a breeze blows, it can send you into reverie. Only in spring. We must wait. 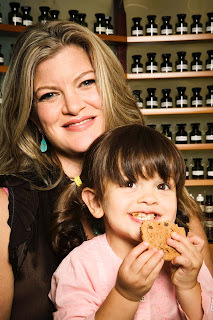 It's funny that you talked to Bay Area residents about summer scents. We live less than two hours south, and we've had to have our heat on the last few days. Someone once quipped that the coldest time he'd ever spent was San Francisco in July. Thanks for a stellar series! Lovely series! I really enjoy reading all these comments, and I want to go on all their vacations! Such a fascinating series. Yosh's vacation destinations sound absolutely ideal to me. She's my female Claude. :-) And I definitely want to get that violet scent from Bell'occhio. I'm still searching for the perfect summer scent & reading these interviews voraciously. Wish that summer fragrance wasn't always full of marine, grass, green, bergamot, lavender, rose ... bah. Maybe I'd like lemon?? Lemon & cuke maybe? Still looking. Heat on? It must really cold. I hope summer returns to you though! Oh, I am so glad it arrived! Wait--did you send me that?? I thought it was Mr. Lily! thanks so much!! Thank you, and I hope you are feeling better! Oh dear! I just sampled Peace Comes From Within last week...that musk thing is very funky on me, but I guess it works fine on its creator! Anyway, I prefer it when the perfumers talk about other people's creations that they like. Somehow mentioning one's own fragrance seems like a plug. I'm more interested in what they find inspiring in other people's work. I take it as an indicator that they really create things for themselves so to say: according to their taste, something that they would (and do)wear. And that's a good thing as far as I am concerned. I live about and hour and a half east of SF and we are in the nineties and eighties (definately no need of heat here, oh the wonderful microclimates of California). I admit I was intrigued by Yosh's Bell'Ochio scent and highly amused by here cheapie pick Sakura and Green Tea. Really did love the fact she admitted she had created a fragrance that she herself could not wear. I am intrigued by the Bell'Ochio too, have to find a way to try it. Oh, how interesting and fun to read! Thanks Marina!! This post is another confirmation why I love Yosh so much. :) She's brilliant, and so are her creations (but you already knew that). I know you are a big fan. She is definitely very lovely.